When an opportunity comes knocking, the logical thing to do is to grab it with both hands. DeAndre Hopkins understands this. The athlete gave up his senior year of a stellar college football to participate in the 2013 NFL draft. Since his selection in the exercise, he has played as a wide receiver for the NFL’s Houston Texans. Hopkins who played multiple sports during his time in high school and college has been etched into the history books of the Houston franchise and we have a feeling he still has a lot more to give. 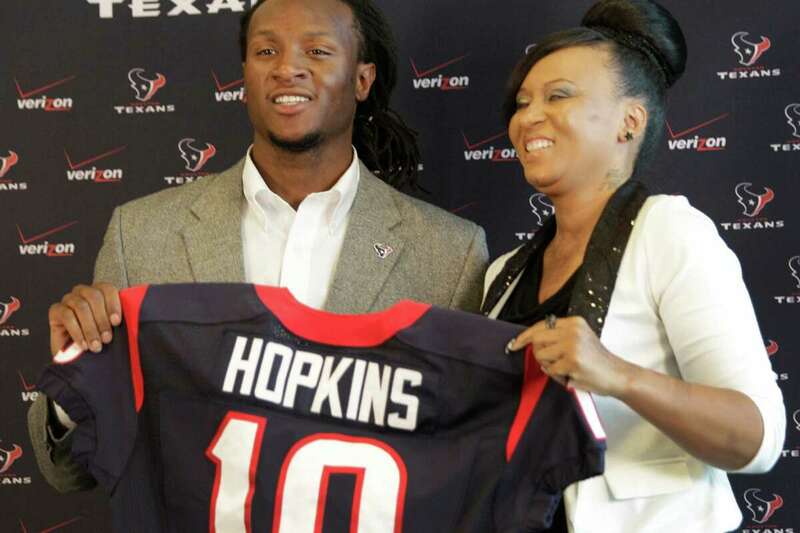 Hopkins was born DeAndre Rashaun Hopkins in Central, Pickens County, South Carolina, on June 6, 1992. At D. W. Daniel High School, Andre was on the school’s football, basketball, and track and field teams. He excelled in all sports such that by the time he was leaving, he had recorded 18 touchdowns and 57 receptions for 1,266 yards in offensive play and 28 interceptions and 5 touchdowns in defense. During his high school football career, Hopkins had 57 receptions for 1,266 yards and 18 touchdowns on offense and 28 interceptions and 5 touchdowns on defense. He also posted 1,453 career points for his hoops endeavors and landed the title of Independent Mail’s Player of the Year in his final year. In DeAndre Hopkins’ rookie season at Clemson University in 2010, he garnered 52 receptions, 637 yards, and 4 touchdowns. Each of these stats continued to go up for his sophomore and junior seasons, the latter in which he sealed 18 touchdowns, the best ever by any Clemson University player. He was named to the First Team All-Conference for his contribution. In January 2013, Andre opted to skip his last year of college education to try out for the draft. During the exercise, he was rated highly and drafted in the first round (27th overall) by the Houston Texans. In July of 2013, the South Carolina native signed the dotted lines on a four year $7.62 million contract. Despite a lot of his performances dulled by the inefficiency of starting quarterback Matt Shaub, Hopkins finished off his rookie season with 52 receptions for 802 receiving yards and was called up to the NFL All-Rookie Team. Working under a new coach for the 2014 season, Hopkins had an improved season. He posted several games with 100 or more receiving yards, ending the campaign with a team-high 76 receptions for 1,240 yards, and 6 touchdowns. He started all 16 games of the regular season. In 2015, following the departure of veteran player Andre Johnson, Hopkins became the undisputed wide receiving starter for the Texans. By the end of the 2016 season, the wide receiver had put his name among the company of icons like Antonio Brown and Julio Jones. He also posted his best ever career stats recording 111 receptions, 1,521 receiving yards and 11 touchdowns, the latter of which became the highest number of touchdowns by any player in the team’s history. He was named to his first Pro Bowl as a result of his performances and also got on the second-team All-Pro, landing on the No.19 spot on NFL’s Top 100 Players of 2016. By his own standards, 2016 was not a good season as he recorded the lowest stats of his professional career so far. This was partly due to the shortcomings of quarterback Brock Osweiler. In August 2017, DeAndre Hopkins penned a new five-year deal worth $81 million. He upped his game from the previous season and was rewarded with his second Pro Bowl as well as his debut First-Team All-Pro honors for leading his team in receiving touchdowns and scoring points. The footballer’s nuclear family tree is interwoven with dark stories. He was born to Sabrina Greenlee and Harris Steve Hopkins, a career drug dealer who died when DeAndre was just five months old. He and his mother had been in the car with Harris the vehicle caught a snag, somersaulted and slammed into a guardrail. He died a week later due to the severity of his injuries. Harris had been out on bail at the time of his death leaving only Sabrina to raise Hopkins and his brother and sisters, Sabrina had to take up multiple jobs in order to make endsmeet. In 2002, Hopkins mother suffered severe burn injuries to more than 17 percent of her body when she was doused with a booking mixture of bleach and Iye by a lady who she had caught her boyfriend with. She was out in a coma for three weeks and had to undergo skin grafts to save her face. This tragic experience left her with only 60 percent visibility in her left eye and complete blindness in her right. The woman who attacked her was later given a 20-year sentence on accounts of assault and battery with intent to kill. DeAndre Hopkins has two older siblings, Kesha and Marcus, who are actually from a prior relationship his mother had. His younger sister is Shanterria Cobb who also attended D. W. Daniel High School where she was a stellar basketball athlete. His sister, Kesha works as a basketball trainer and slot receiver for the Houston Wildcats under the Independent Women’s Football League.